RICHMOND, Va. (VN) — Two teammates: that’s all rainbow jersey hopeful Peter Sagan can count on for support in the 2015 world championship road race, as Slovakia will start just three riders in Richmond. It may not sound like much, but Sagan himself deserves some credit to have even those two teammates with him. Over the past few years, the Slovakian king of consistency has landed highly in the UCI WorldTour rankings without fail, and has thus been the driving force behind Slovakia’s roster allotment at the world championships. Indeed, at this point, it would be a big surprise to see Slovakia without at least a few riders at worlds. Such is Sagan’s talent. And at age 25, he’s not likely to go away any time soon. But there are dozens of other nations that don’t fit the mold of traditional cycling powerhouses, for which participation is always up in the air, relying on the standout performances of one or two big national stars. Serghei Tvetcov, born in Moldova, was that country’s sole representative in the 2013 worlds road race in Florence. But Moldova didn’t send anyone to the road race in 2014. Tvetcov switched his registration to the neighboring country of Romania, where he has been a resident in the past — he mostly lives in the United States now — and took his strong palmares with him. He led Romania in Ponferrada in 2014, and he will be Romania’s lone starter Sunday in Richmond. The former Jelly Belly rider, who now races for the Italian Androni Giocattoli squad, will take on Sunday’s worlds finale with less support than he’s used to. “You’re just working for yourself. You need to be really smart. What you do, what you eat, what you drink during the race,” Tvetcov said in Richmond. Tvetcov was on the podium at the 2014 USA Pro Challenge, and has had a few nice Europe Tour results in 2015, but a world championship without teammates requires a slight recalibration of expectations. Crossing the finish line would be great, but putting on a show is everything. “The first goal is going to be a breakaway, and the second goal is going to be to finish the race,” said Tvetcov. Sporting the Romanian colors in a world championships is its own reward for Tvetcov. It’s something many riders in similar situations have in mind. The opportunity to show the cycling world a flag that some fans may not recognize is one that doesn’t come around every day. Debesay’s home country has had a marquee cycling season, with MTN-Qhubeka’s Daniel Teklehaimanot winning the mountains classification at the Critérium du Dauphiné, and then wearing the polka dots for a few days in the Tour de France. Eritrean fans have gone mad for cycling in the wake of the sudden global exposure, and Richmond provides the perfect opportunity to show off the national colors on the international scene. “It’s a good experience for me, because this is the world championships. For me, to participate in this from my country, it’s a big experience, with the world’s biggest riders here Sunday,” Debesay said. Racing fans might be surprised to discover that it is Debesay starting for Eritrea instead of Teklehaimanot. However, it was Debesay delivering the more consistent results across the year, and that’s what counts for both roster spot allotment and team selection. Eritrea earned several more spots at the under-23 level, with promising young rider Merhawi Kudus taking 11th in the road race. At its core, the worlds qualification process goes a long way towards offering the less prominent cycling nations a chance to make an appearance in a huge international event. 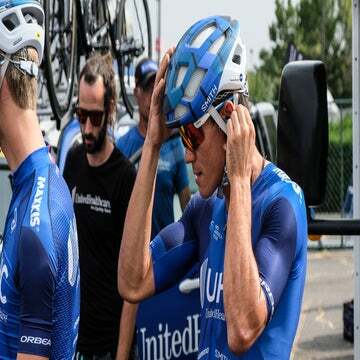 Then again, the details could probably use some tweaking; relying on WorldTour rankings and Continental Tour rankings to determine roster allotments, some very talented riders can fall through the cracks, as WorldTour pros who land big Continental results don’t place in the Continental Tour rankings. For the non-powerhouse countries with one or two big stars, that can be a problem. For several years, Astana teammates Tanel Kangert and Rein Taaramäe have consistently been the biggest fish in the small pond of Estonia, a country that is home to fewer people than the city of San Antonio, Texas. Both riders had strong 2015 seasons, with Kangert playing a key role in Astana’s Giro and Tour squads, and Taaramäe racking up several victories. But domestique duty doesn’t earn worlds roster spots, and Taaramäe’s big wins all came on the Europe Tour this year, where he can’t be ranked thanks to riding for a WorldTour team. Estonia’s younger Continental Tour riders earned the team more entries than their two stars did this year — though Kangert and Taaramäe will still lead the team Sunday. Maybe that’s a good sign for the future. Having two riders of WorldTour caliber to watch probably didn’t hurt the young guns. “This year we got qualified thanks to the points the younger guys earned on the Europe Tour, so I think we have a pretty good up-and-coming generation coming. The whole nation isn’t relying on the two of us,” said Kangert. Racing for a two-man team, Kangert won’t be riding with the sort of powerhouse train that he is used to at Astana, but he and Taaramäe will now have the rare chance to do whatever they want in the race. “We can improvise a bit better, and that is something I really appreciate and like,” Kangert said. Two Estonians, three Slovakians, one Eritrean, and one Romanian in the men’s elite race, starters from Ecuador, Costa Rica, and Serbia too — it may not sound like much, but it’s not every day that these nations even send that small a number of riders to big international events. For now, it’s an opportunity to expose the greater cycling world to talent sources that don’t often get coverage. It’s also an opportunity for the starters to blaze the trail for the younger generation, so that one day, three starters might become four or five, or even nine.